There has been a rapid surge in the research and exchange of ideas in various areas of chemistry such as organic, pharmaceutical, analytical, and medicinal chemistry. It is well recognized that heterocycles are vital components of many biochemical processes. Pharma industry comprises more than 75% of top selling drugs that are of heterocyclic origin. Among many diseases, cancer can be considered to be a dreaded disease that has overtaken the masses across the globe. Hence, there has been a need to develop drugs that are less toxic and do not provide resistance in the long run. 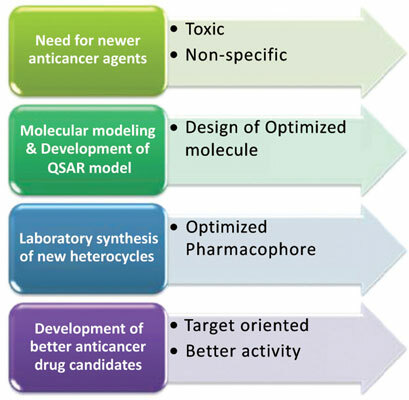 Thus, this need-based development of anticancer drugs through the use of heterocycles has gained its pace since last two decades and there has been a gush among the researchers to apply various approaches in designing anticancer molecules. More specifically, research is being targeted on the utilization of molecular modeling techniques for developing new anticancer agents specifically targeting various cancer cell lines, specific enzymes and tissues. Some of the important and conclusive findings using this approach have been presented in this review. Heterocycles, molecular modeling, anticancer activity, pharmaceutical, medicinal chemistry, analytical.